Baltimore RNLI assisted three crew members on board a 20m fishing trawler which got into difficulty off West Cork late last night (Monday 20 January). The volunteer lifeboat crew was requested to launch their all-weather lifeboat by the Irish Coast Guard at 11.10pm following a report that a 20m trawler had lost steering three quarters of a mile south west of Cape Clear. 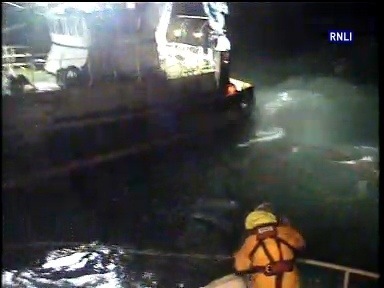 The lifeboat under Coxswain Aidan Bushe launched at 11.18pm and made its way to the scene. The weather at the time was described as blowing force four to five south westerly winds and there was a three metre swell. Having established a tow line, the lifeboat brought the vessel safely back to Baltimore. Speaking following the call out, Tom Bushe, Baltimore RNLI Lifeboat Operations Manager, said: ‘The vessel encountered difficulties late last night when it was dark and the weather conditions were fairly challenging. We were delighted to be able to assist and help the crew bring their vessel to safety’.